So here we go for round 2. Love the combination of pink and orange. Would these colours work for a blonde? Cause in that case I am totally going shopping. I want those sunglasses. Plus the look on his face made me giggle. Always a good thing when a man can make you smile right? She wore leopard shoes AND she has a leopard rug! So jealous. 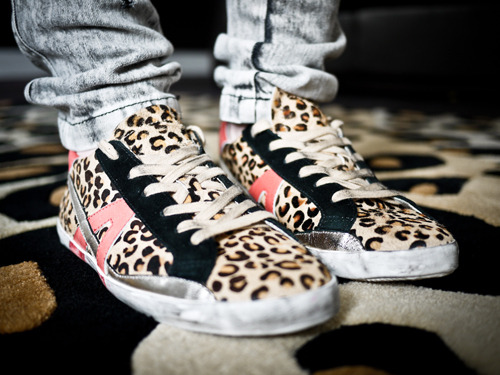 As seen by this post, I am a big leopard fan. Huge. So now I have been scouring this site she got the shoes from and I am so close to ordering them. Even though I have more than enough shoes. Seriously. Imelda Marcos has nothing on me. Very laid-back and elegant. And such a cute dog! Tell me, which one is your favourite? Those colors would definately work for a blonde! Loving them!! I love the chic and cool look of Song of Style as well!! Thanks for sharing such a wonderful pics.. love your blog and bookmark so please update and add some more pics...Thanks again.